Track your dogs and make corrections from the same screen. When Garmin bought Tri-tronics last summer, we knew an all-in-one GPS / Ecollar system was coming. Introducing the Garmin ALPHA: A GPS tracking collar by Garmin with an E-Collar from Tri-Tronics. Track and train from a single screen. One handheld. One collar. 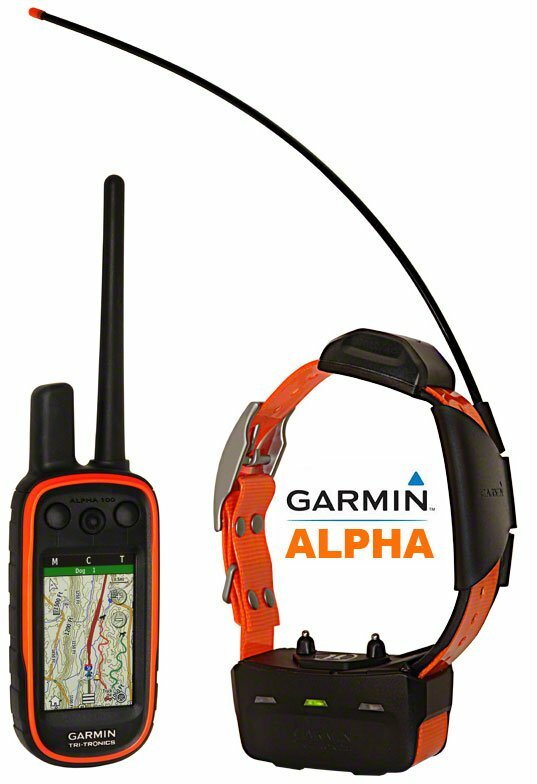 The Garmin ALPHA improves upon the GPS features of the best-selling Garmin Astro and combines this with the functionality of the best Tri-tronics dog training collars. 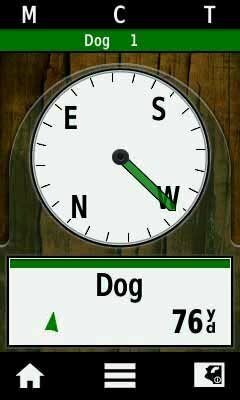 GPS Improvements include faster update rates, touch screen, longer battery life, rescue mode, "buddy" tracking, tracking up to 20 dogs, and my personal favorite - the direction option in the Compass screen. E-collar improvements give you the full functionality of a $500 Pro-500 for only $250 more than the price of the Astro alone. You can also recreate your favorite Tri-tronics e-collar, or build a custom set-up with the perfect stimulation types and settings for each one of your dogs. All-in-one, combination products tend to be the worst of both worlds. Seldom does combining two products into one lead to a piece of gear that's as good as either of the originals. Fortunately, the Garmin ALPHA is more than just a GPS and an e-collar stuck together. A lot of work went into designing the ALPHA resulting in an elegant system with very intuitive controls. The folks at Garmin were very responsive to our feedback in what we wanted in a COMBO system. P.S. 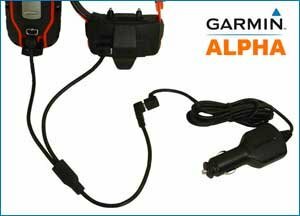 PLEASE NOTE: The ALPHA is NOT compatible any other Garmin Astro or Tri-tronics collars. We wouldn't have the faster 2.5 second update rate AND we wouldn't have the 20-dog expandability if the ALPHA was backwards compatible with any other systems. Plastic-coated nylon collar strap so it doesn't get smelly. ALPHA is GPS + E-collar. Astro is only GPS. The Alpha is a GPS tracking system AND a remote training collar in one. The Astro is only a GPS tracking system. ALPHA tracks 20 dogs. Astro tracks 10 dogs. The Alpha can track more dogs than the Astro. The Alpha can track up to 20 dogs and Buddies compared to the Astro only tracking a total of 10 dogs. ALPHA can track Handhelds ("Buddy Tracking") like dogs. Astro cannot. Track additional handheld ALPHA units like you would track another dog. ALPHA has 100 ID Tracking Codes. The Astro has 50. ALPHA has a 2.5 Second Update Rate. Astro starts at 5 seconds. ALPHA battery has a 34 hour run-time (in the 5sec update). Astro is ~22 hours. Track up to 20 dogs. UPDATE RATE is the rate at which the GPS collar radios the Handheld and updates the position, speed, direction, and activity of the dog. A faster update gives you more information, but drains the collar battery faster. The upside to a 2.5 second update rate is that you'll know if your dog is on point or has treed twice as fast as before. A 2.5 second update rate isn't real-time, but it's twice as fast as the current Garmin Astro. This is another good thing that folks have been wanting added to the Garmin GPS systems. Whether or not we can get much faster than that in the future is a good question. 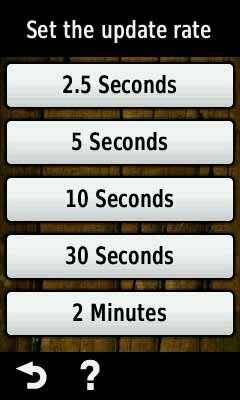 2.5 Seconds is still pretty awesome. ALPHA has 100 ID CODES. Astro has 50 ID CODES. The ID CODE is what differentiates one Garmin ALPHA collar from the next, so you can run many Alphas in the same area without interference. If you are only running 5 dogs, instead of only having 50 codes, now you've got 100 codes which should really eliminate interference for the guys that aren't running that many dogs. For the 99% of the folks, increasing the number of ID CODES and eliminating more chances for interference is a great feature. 50 extra codes will help guys running a huge number of dogs, but it's not going to completely eliminate interference. 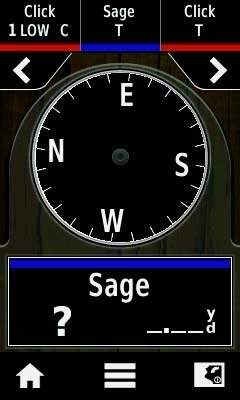 NUMBERING SYSTEM Garmin also changed the way they are numbering ID CODES. The Astro is numbered 1-50. The ALPHA has five numbered sets, and then each number has 20 subsets. 1-0, 1-1, 1-2, 1-3 and it goes all the way up to a 5-17, 5-18, and 5-19. This is designed to keep folks from thinking that you can track and Astro and an ALPHA at the same time (which you cannot). 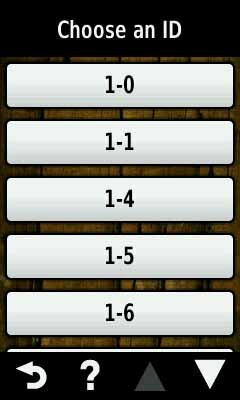 Better: PIN Codes are built in. ALPHA has PINs enabled by default. Astro PINs are not on by default. The TRACK CODE is a 5-digit PIN number so other handhelds can track your dog. 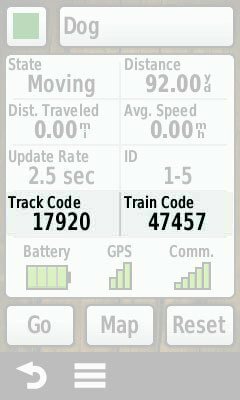 The TRAIN CODE is a 5-digit PIN number that allows other handhelds to track AND stim. Unlike the Astro, the Garmin ALPHA has the PIN CODE feature built-in -- mainly because of the STIM option. With the ALPHA, you cannot track a dog just by knowing (or guessing) the ID CODE. 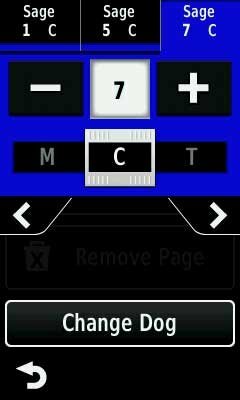 On the ALPHA, you must have either the collars TRACK CODE (track on handheld only) or TRAIN CODE (track and train on handheld) to see the dog on a different handheld. Track other hunters while running your dogs. "Contact tracking" allows you to track other ALPHA handhelds just like you would track another dog. Each ALPHA handheld can track a total of up to 20 dogs / handhelds. For example, say you and I are hunting together. I can put your ALPHA handheld into my system, and I'll be able to not only watch where you are, but I can also locate you the same way that you could a dog. "BUDDY TRACKING is a useful feature if you hunt in deep cover, hunt where folks spread out a lot, or simply want to keep up with other folks coming and going." BIRD HUNTERS -- When I was bird hunting with my dad, at some point later in the day he'd say, "OK, I've had enough. I'm going back to the truck." It would have been nice to know where he was. ALPHA can do this. For hound guys, hog folks, or rabbit hunters, CONTACT TRACKING is a pretty big deal, because rabbit hunters have a tendency to spread each other out a little bit when they are running rabbits. We pheasant hunters get into some really tall cover sometimes, and keeping up where everybody is can be difficult. Knowing where your friends are walking while hunting is just safe hunting. The only downside to CONTACT TRACKING is that you have to keep the handheld on to be tracked, because it has to send out a ping which drains the battery. Garmin has significantly improved the collar battery life with the ALPHA. Even using the twice-as-fast (battery draining) 2.5 second update rate, the ALPHA has around 24 hours of battery life compared to about the same run time with the slower (5sec) update on the Astro. Garmin has figured something new out with these batteries. Right now we're getting around 23 hours of runtime with five second update on the Astro DC-40. I was expecting the ALPHA's 2.5 second update rate to be more like 12 or 15 hours of run time, but we are getting 24 hours at a 2.5 update and 34 hours out of the 5 second update. And that's without using the new feature called Rescue Mode. This collar antenna is tougher (made of braided steel) so it can handle the rough environment where you run your dogs. The Garmin ALPHA comes pre-loaded with a detailed 100K topographic map which normally retails for $100. TOPO maps are great for hunters because they show roads and waterways which make it easier to find your dog. For example,it's much easier to find your dog when you know that your dog is on one side or the other side of a creek or river. 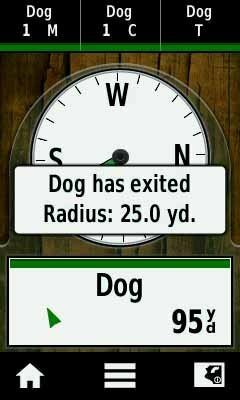 The COMPASS SCREEN (screenshot) has an arrow pointing to where the dog is in relation to you, how far away he is, and an ICON shows you if the dog is moving or stationary. You cannot see the direction he's moving in. If you turn on RUNNING POINTERS, when your dog is moving it changes the ICON from a running dog to an arrow that points in the direction that he's moving. When the battery on a tracking collar dies, finding a missing a dog gets a lot more difficult. When the collar battery drops to 25% life, RESCUE MODE changes the update rate to a 2-minute ping to extend battery life which gives you up to 12 hours to find a lost dog. Rescue mode is not the default setting. You have to turn it on under SETTINGS. I can't think of a good reason NOT to run your collar in rescue mode because there's no downside to running in rescue mode. If you know where your dogs are with 25% battery life left, you can manually switch to a faster update rate from the ALPHA handheld and keep on hunting. Garmin has added two new location alerts to the Alpha: Geofences (from the GTU tracker background) and a new Radius option that tells you when your dogs get a certain distance away from you. 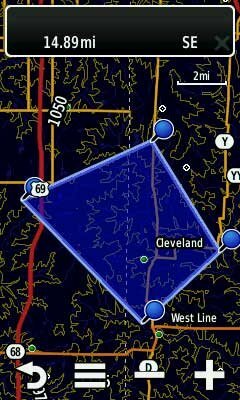 A GEOFENCE is an area on the GPS map that you define. You set a zone, and get alerts on your ALPHA when you dogs enters or exits a Geofence area. Know where your dog is without having to watch the screen the whole time. To create a GEOFENCE you go into the location alert menu and set an area on the mapâ€”you can make them as big or as small as you want to, within reasonâ€”and then your warnings will tell you if a dog enters or exits this area. For example, your dog doesn't know what land you can or cannot hunt on. Set up a GEOFENCE for your hunting lease. I've also used GEOFENCES to mark a spot where I don't necessarily want my dog to go -- like posted land next to my lease. Once he enters that area it's going to tell you. GEOFENCES are great for around the house, too. Your ALPHA will tell you if your dog leaves your property. One of the features that they've added is you can take your handheld, and while you're tracking dogs, plug it into your computer and you can view your dogs on the screen. 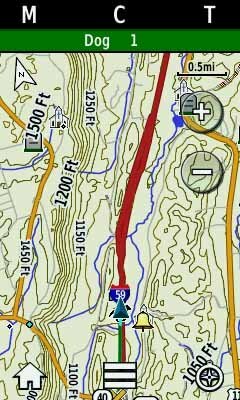 First download Garmin's Base Map Software. Then plug your Alpha Hand held into your computer's USB and you can see the Tracking screen on your computer. We've got guys that are working out of vehicles and they are tired of looking at a small screen all the time. They want to set up a computer in their vehicle and be able to view the tracking. You still having to have a handheld to track, but you'd be able to use the screen of your computer instead of having to look at the small handheld screen. They're saying it'll track on the computer real- time, but it's not. It's not real-time; it's the same update rate that you have on your system. Another new feature on the Garmin Alpha is collar lights. Similar in concept to the Tri-Tronics tracer lights, the Garmin Alpha lights are built into the collar and activated from the handheld. Choose between solid light, slow-flashing or fast flashing. 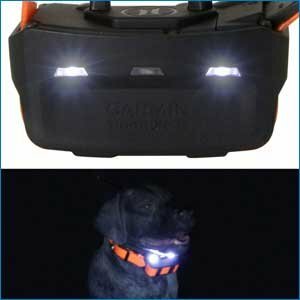 For safety, if you're running dogs at night, Collar Lights are a good thing to have when your dog gets out on the road. The only downside is that there will be some additional battery drain - especially with the solid light. We expect a solid light will cut battery life in half while the flashing lights will only cost you around an hour or two of run time. You can now easily pick and change the icon color for your dog in the Dog Info Screen. Matching the dogs colors to your collars strap colors on the Alpha is a bigger deal especially with the e-collar part. Now you can say, "I want this dog to be BLUE on the handheld," and you can put a BLUE collar on this dog, "And I want this dog to be orange; I'll have an orange collar on this dog. I want this dog to be red. We'll put a red collar on this dog." And you can very easily, from the dog info screen, adjust those colors so you know which dog is which. Not only are your trails and your compass lines going to match those colors but you will also match the e-collar portion of the system. It will help tie all those things together and help make sure you do not correct the wrong dog. 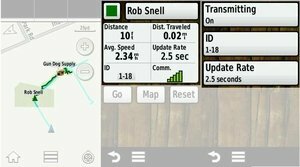 While the Alpha comes with the preloaded TOPO map you also have the option of adding additional maps both in the Onboard Memory Capacity and via the Micro SD Card Slot. 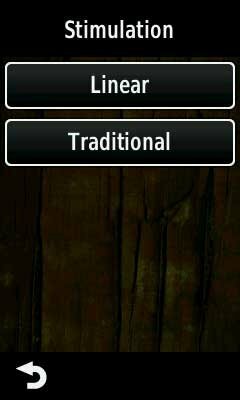 Extra map space allow you the option to use multiple maps in the same handheld. Quickly transfer high-resolution satellite imagery to your Garmin handheld device to get a true representation of your surroundings with a 1 year subscription to BirdsEye Satellite Imagery. Use your BirdsEye Satellite Imagery subscription with BaseCamp software to quickly transfer an unlimited amount of satellite images to your Garmin device and seamlessly integrate those images into your handheld's maps whenever you need them. Transfer an unlimited number of satellite and aerial image segments to your device with this subscription and free software BaseCamp. High-resolution sub-meter color satellite imagery captures the world in brilliant clarity and detail. Allows you to layer the Garmin vector maps on your handheld (such as TOPO 100K, TOPO 24K or City Navigator) with BirdsEye Satellite Imagery for a real-life view of roads, buildings and terrain. Makes it easy for hunters to perform preseason scouting, determine placement of stands and locate game pinchpoints. Helps hikers and campers find trails/trailheads and clearings for camping areas. Lets geocachers determine the terrain type around a cache and identify parking areas close to the caches. Allows travelers to view tourist hot spots and landmarks from an aerial view to make excursions memorable without getting lost. My favorite thing about Garmin purchasing Tri-Tronics is the STIM levels. The ALPHA has the consistent stimulation levels that Tri-Tronics has used for years. The Garmin ALPHA combines GPS with the functionality of the best Tri-tronics dog training collars. E-collar improvements give you the full functionality of a $500 Pro-500 for only $250 more than the price of a Garmin GPS-only collar. You can also recreate your favorite Tri-tronics e-collar, or build a custom set-up with the perfect stimulation types and settings for each one of your dogs. For example, if you are strictly using a collar to stop dogs from running trash, the ALPHA is going to work great for that -- just use the BASIC setting right out of the box. But if you are also training your dog -- doing fine tuning and gradual stimulation increases, and you are using low level stims to communicate with your dog, the ALPHA gives you those options as well... It's easy to customize! I was expecting the Alpha to only be a hunting collar for me, and I was going to have to keep something else for the way that I train. I can use the ALPHA as my only dog training system if I want to. The ALPHA a versatile enough remote training collar that no matter how you use your collar, the Garmin Alpha will work for you and how you train your dogs. I do not like correcting dogs that I can't see. Combining dog training collars and GPS tracking collars into a single system is a very powerful idea, but be careful! Some folks will make corrections solely based on what the screen says the dog is doing. Using the Garmin ALPHA makes giving "blind" corrections safer than in other situations, but you need to remember that there always a short delay between what your dog is doing and what you see on the screen. The length of this delay is based on the update rate you select. While that short delay isn't a big deal while tracking a dog, you MUST take that delay into account when you are making any correction based solely on what you see on the screen because your dog may have turned back or stopped misbehaving before the screen indicates that. Track and train from the same screen. Press button,stim the dog -- the DASHBOARD slides out. Here you can change STIM level or TYPE of STIM. To change levels,press + / -. 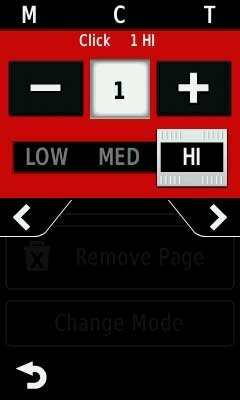 Move between buttons with KEYS or move between PAGES. My favorite thing about Garmin purchasing Tri-Tronics is that the ALPHA has the consistent stimulation levels that Tri-Tronics has used for years. We also have the exact same tone so if you dog has been trained with it, there shouldn't be any issues. We are also pleased that the ALPHA tone is a good bit louder than we have seen from TT collars lately. You can make your ALPHA E-collar Set-Up as simple or as complicated as you need depending on how you train your dogs. For example, if you're running one or two dogs, or trashbreaking any number of dogs, you can run your ALPHA the way it comes out of the box and do everything you need to do using the Basic Set-up. However, if you're doing more complicated dog training, or running multiple dogs with huge differences in temperament, the custom set-up is perfect for you. You can use the Basic Setup where you have one dog per screen with dedicated buttons for Continuous, Momentary and Tone. You can raise and lower the levels as needed. 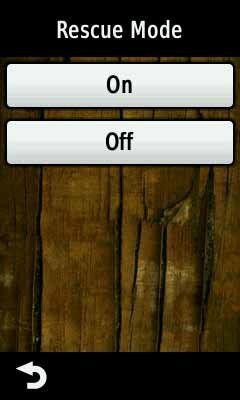 In this mode the the left button is always Momentary, the Middle Button is always Continuous and the right button is always tone. You have one setting for the stimulation level and you can raise and lower it as needed. The level is always the same for both Momentary and Continuous. In the Basic Setup levels are independent of each dog so you can work multiple dogs from the same handheld with different stimulation levels. When you raise or lower stimulation for one dog, it does not change the stimulation level for any of the other dogs on your hand held. In the Custom Setup, you can have multiple stimulation PAGES for each dog, if you want to have multiple levels available at the same time. You can fine tune the stimulation levels as much as you want. If you need two or three screens per dog to get all the stim level choices that you want, that's easy to do. Both the collar and the handheld use rechargeable batteries. One of the new features of the Garmin ALPHA is a rechargeable battery pack in the handheld instead of using AA batteries like the Astro. Garmin says that you are going to get between 16 and 20 hours from a full charge. The handheld battery must be inside the unit to be recharged. The advantage of not using AA batteries is that it will save you some money on buying either replacement batteries or buying a set of rechargeable AAs and a charger. The downside to not using AA batteries is that you can't just throw some extra batteries in your pocket, and pop â€˜em in the handheld if it goes dead in the field. The ALPHA comes with a Car Charger, so if you are working out of a vehicle or if your battery runs down and you need to track a dog, you can plug it into your 12 Volt on your car, plug that into the handheld, and it will track while it charges. You also have the option of buying an additional backup battery pack in case you want an extra for in the field. This is what I recommend for folks like myself that hunt multiple days in a row and might need a backup. It's really tricky to give exact run times on the Garmin ALPHA because there are so many variables. Collar battery run time is most affected by update rate, but will also vary depending on use of remote STIM, tone, and collar lights. The other new improvement in the charging system is that the lights now tell you when your collar has a complete charge. When you snap the charger to the collar, the light flashes red while it is charging. When it is finished, the light glows a solid green. If you are not getting a charging connection, there will be no light. Due to varying regulations, this version of the Alpha is approved for use only in the United States. The sale and unlicensed use of the Garmin ALPHA GPS Dog System in any form is presently prohibited by the Canadian government. According to a document published by Industry Canada dated June 2009, the MURS radio frequency used by the Astro will be permitted to be sold and operated on a license-free basis at the end of a five-year transition period (June 2014). Read this; http://www.ic.gc.ca/eic/site/smt-gst.nsf/vwapj/sp17-ps17-eng.pdf/$FILE/sp17-ps17-eng.pdf Industry Canada Ruling on Garmin Astro in its entirety (PDF file). Parties interested in the implementation of this spectrum utilization policy or with questions should contact their local Industry Canada office. 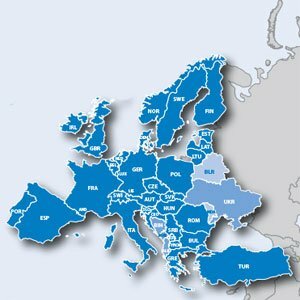 The radio communication frequencies utilized for the United States models of Garmin Alpha and Astro products may not be authorized for use in Europe. To ensure compliance with local laws, the radio function that allows U.S. Garmin Astro and Alpha dog collars to communicate with their respective handheld devices will be rendered inoperable when used in Europe. For products sold before this modification, the radio function will be rendered inoperable with future updates of those products' firmware or software. Please note the GPS functionality of these systems will not change and will continue to work in Europe. Special thanks go out to Bryan, Ted, Nik, Jimmy, Mike, and all those engineers that we love at Garmin for putting up with another year of all my calls and questions. I absolutely love the directional arrows in the compass screen. A very special thank you to Bob West of Purina for hooking me up with Garmin back in 2007.